Haze that blanketed the South Sumatra provincial capital of Palembang during yesterday morning's rush hour was so thick it obscured the tops of tall cellphone towers and there is no relief in sight, weather forecasters said. 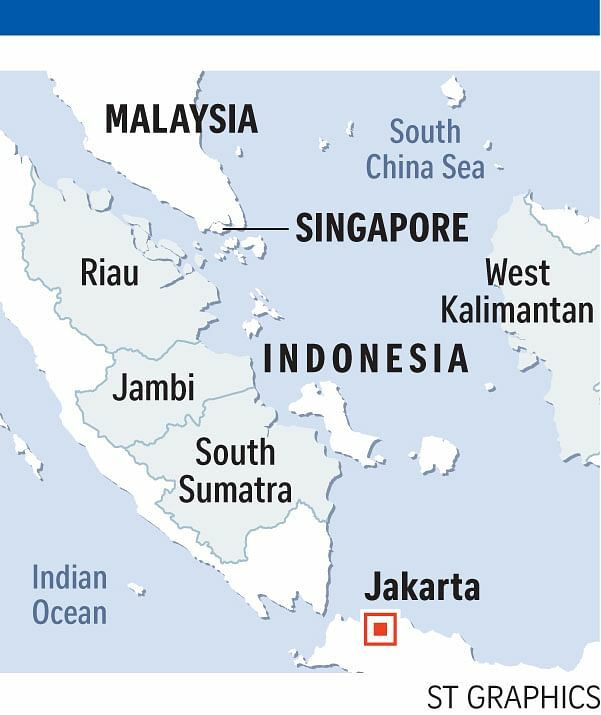 Emanating from forest and land fires in Jambi, as well as South Sumatra, the smothering shroud expanded north to neighbouring Riau, just one province removed from Singapore. In Palembang, visibility dwindled to about 300m as residents endured a second straight day of the worst bout of haze so far this year, and the acrid smell of burnt peat hung heavily in the air. On the Musi river, which flows through the city of 1.5 million people, the haze made navigation difficult. The Ampera Bridge, a major city landmark built during Sukarno's rule and opened in 1964, could barely be seen. "The haze this morning was the worst so far this year," said speedboat driver Iwan, 35. "The haze is really making navigating much tougher," he added. Hotel worker Yassir Abdullah, 25, said he was worried about coughing and respiratory problems, and feared the haze was going to get worse. Indeed, there is little chance of rain in southern Sumatra in the coming months, according to Jambi's meteorology, climatology and geophysics office. "We cannot rely on nature to help douse the fire. Human efforts are needed," Mr Okta Irawan, a weather forecaster there, told The Straits Times. With visibility dropping to as low as 500m in the mornings yesterday and Wednesday, flights to airports in Jambi and South Sumatra provinces were delayed. South Sumatra provincial administration has started distributing 15,000 masks to its residents, after the number of hot spots rose to 125 on Wednesday (the latest available data), up from 44 the previous day. The Jakarta Post reported that schools in Siak regency, Riau province, had sent home students because the haze had reached dangerous levels. Schools there will remain closed until tomorrow. Prevailing winds were also carrying the haze to Singapore and parts of Malaysia. Yesterday, the Singapore National Environment Agency's website showed a slight improvement in the haze situation. The 24-hour Pollutant Standards Index (PSI) was in the moderate range as of 5pm yesterday, and is expected to remain at about the same level today. Manjung in Perak had the unhealthiest air in Malaysia. Its Air Pollutant Index (API) spiked to 103 in the morning, according to The Star. The API reading in Port Klang in Selangor reached 102. Natural Resources and Environment Minister Wan Junaidi Tuanku Jaafar said Malaysia had written to Indonesia asking Jakarta to put out open burning fires as quickly as possible.